Early in the development of the Aberdeen Angus, Hugh Watson of Keillor, Scotland arbitrarily decided that black was the proper colour of the breed, and therefore started a fashion. He may have well chosen Red instead. Red Angus cattle have all the attributes of Angus cattle with the following advantages. Red Angus are homozygous for the red colour and when crossed with red always breed red. Red is the most numerous colour of all cattle breeds worldwide. 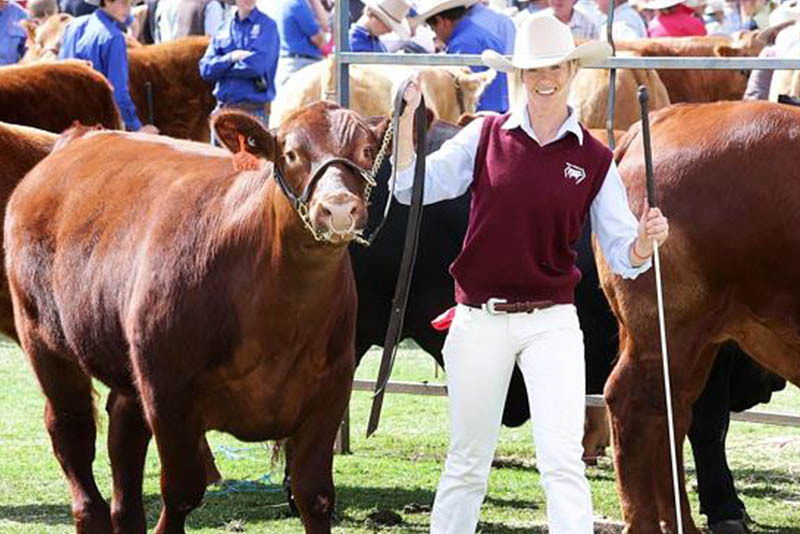 Commercial breeders of other Red breeds can maintain consistency of colour in their crossbreeding programme by using Red Angus. Red is more heat tolerant than black and has an advantage from Buffalo Fly. Buffalo flies tend to congregate on black cattle by preference, giving red coated cattle an advantage in regions with Buffalo fly. Homozygous & Heterozygous: If a calf receives identical genes from both parents for a particular characteristic, ie the genes on that pair of chromosomes are the same, and the animal is said to be homozygous for that trait. But if it receives a particular gene from one parent and an alternative from the other, the pair is made up of two different genes, and the animal is said to be heterozygous for that characteristic. BB – Black. This animal is homozygous Black. Bb – Black. This animal is heterozygous Black and will be a carrier of the Red gene. bb – Red. This animal is homozygous Red and when mated to Red coated cattle will only produce Red.